You can apply a pencil texture to an existing pencil line. You can also change a textured pencil line's texture by following the same steps. NOTEYou can also apply pencil line textures on artwork created with the Line, Rectangle, Ellipse and Polyline tools. In the Drawing or Camera view, select a pencil line. In the swatch list, select the pencil texture you want to apply to your pencil line. The selected pencil line now uses the selected pencil line texture. In the Tool Properties view, scroll down to the pencil texture library panel. 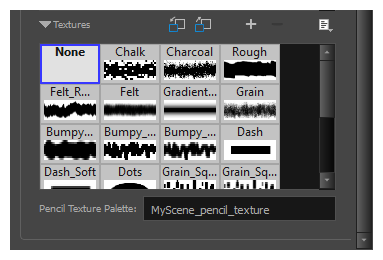 NOTEThe texture library in the Tool Properties view lists the same pencil textures as the ones in the currently selected pencil texture palette in the Colour view. Select the pencil texture you wish to apply.